A few months ago I read about an amazing treat dispenser one could easily build themselves so to the store I went to get the necessary materials to build this great enrichment device. Out of all the enrichment units we have available to our capuchin, this one is without any doubt his favorite. This monkey treat dispenser is available outside his monkey room and the first thing he’ll do when we release him from his room is run towards it to see what we put in it today. He loves to pull the handle up to see what appears in the dispenser hole. We typically put nuts, seeds, or popcorn into this primate enrichment unit which fit perfectly for this device. It’s a enrichment device that will encourage their natural foraging instincts. Interested in making our own? Let’s find out after the break what you’ll need to get started! Cut your 1 1/4″ PVC pipe 5.25″ long. On the bottom of the pipe glue the PVC Cap to close of the bottom. On the top of the pipe glue on the threaded male adapter and your enrichment device is nearly ready! Next you’ll need to drill 2 holes with your 5/8″ drill bit right under the threaded part of the male adapter you just glued onto the pipe. Use your small round file to smooth out the oval hole. Now drill a small hole with your 5/16″ drill bit through the 1 1/4″ threaded PVC cap. Insert your Hex Cap Screw through this hole and screw on the 5/16″ regular nut. The goal of this nut is to make sure the monkey can’t lift the bolt up too much so for right now you’ll need to screw this nut up until the middle of the Hex Cap Screw. On the bottom of the screw use the 2 Hex Cap Nuts to attach the washer. Insert the Hex Cap Screw in the dispenser and screw on the PVC cap and you’re done. You might have to adjust the nut in the middle so it nicely aligns with the hole when you pull the screw up. 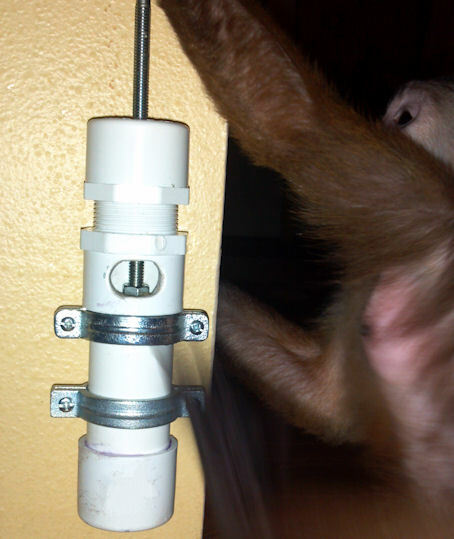 Use regular pipe clamps to attach this monkey treat dispenser to a wall and you’re all set. Now it’s time to fill your treat dispenser with small treats like cereal, pine nuts, gerber fruit puffs, seeds, … and the foraging can begin!